I can’t get an easy question this week, can I? This question isn’t so much difficult as it is very broad – and there is a lot you should know about Mustang tuners before purchasing one for your Stang. A tuner is a device that reprograms your car’s computer to produce the best performance results, with or without modifications. A chip or tuner is mandatory if you want to tune your car. While a chip/tuner cannot fix mechanical problems, it can improve horsepower, torque, and yes – even fuel economy. The most noticeable difference between a performance chip and a tuner is the method of use. A chip installs directly onto the car’s computer and has a selector switch that allows you to change tunes “on the fly”. Chips can hold up to 4 tunes and are recommended for pre-OBD II (1988-1995) vehicles. 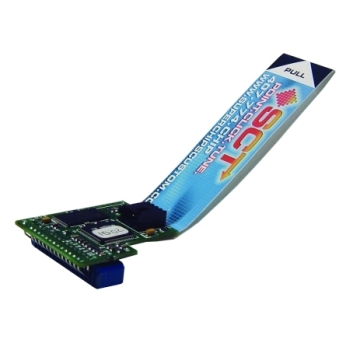 The SCT 4-Bank Eliminator Chip that we offer is not like the pre-programmed chips you see elsewhere on the internet (like eBay for example); if you do not order tunes with the chip it will arrive blank, with no programming whatsoever. While they don’t possess the DTC-reading feature like the flash tuners, they are still eligible for the “Free Tunes for Life” program; however they must be mailed back to us to have new tunes installed. Preloaded tuners (aka “Strategy tuners”) and custom tuners are exactly the same tuner, except with a custom tuner we request information about your vehicle so that we can write custom tunes for your car, which we program into the tuner before it’s shipped out. This is a free service, and with the “Free Tunes for Life” program you won’t need to worry about scheduling dyno-time after your next bolt-on mod – we can send a new tune directly to your email. In most cases we recommend a tuner with the custom tuning, since this allows you to get maximum performance gains with minimum spending. And now a word from our tuners: “With the exception of the Race tune, all of our tunes are now written to receive the most economic gains in regards to fuel. The end result is still 100% controlled by the user. If they drive their car in the same manner as before the tune, 1 to 3 mpg gains have been reported” (Chris Rose, AM/Bama Tuning). In layman’s terms – this means that all of our custom tunes are now written for performance and economy, but if your new custom tunes give you a bad case of LFS (Lead Foot Syndrome), you’ll be missing out on that 1 to 3 mpg. Tuners are an awesome mod, and by far the easiest way to gain power and improve performance – a bone-stock car can gain between 20-25 hp! So, whether you prefer the simplicity and convenience of the SCT SF3/X3 (the only difference between the SF3 and the X3 is the firmware, which is the tuner’s internal programming–the X3’s don’t allow for pre-loaded tunes), or the feature-packed cutting-edge technology of the SCT TSX, you know that you’re in safe hands with the expert tuners at AM. Hop online or give us a ring – we’d be happy to help you choose the perfect tuner for you. Can i make modifications or somehow raise my tower brace so that i can fit a plenum cover under it? You could try adding some washers underneath if you need a little extra clearance, but be careful that the strut tower brace isn’t contacting the hood when you close it. So with Tuner’s I’ve heard that they code themselves to be only usable on one vehicle. I was curious about the truth to that. I have an 04 V6 and an 03 GT and ideally I’d like to make the V6 make use of the few mods it has and have max fuel efficiency. While on the flip side the 03 GT is a play car and I would like to max the power without concern to fuel grade or consumption. Is it possible to do that with one tuner or would that require two different tuners? The tuners can be used on different Mustangs, but to be able to do so you must set the first Mustang back to stock before loading another tune onto the other Mustang. Also, you can only do this 5 times before the tuner will lock to one Mustang. Once this occurs you would have to send the tuner back to SCT to get it unlocked. I am curious as to the max HP that can be bolted on a 2010 4.6 Mustang GT. Can you get 400 Hp without going to power adders? I am 62 and this is my last Toy. I want to keep it a while. I have a 1999 Cobra that i bought used. It has some mods to the exhaust, drivetrain, bigger fuel injectors, and a supercharger from the 2003/2004 cobra. I have no clue whether the previous owner put a tuner on it or had it professionally tuned. Should i take it to a shop and get it professionally tuned or should i buy a self-tuner? Also, if i get a self-tuner, and say i have a 1999 cobra…they dont come with superchargers. So would i let you guys know or should i get a tuner for an 03/04 cobra? Last question, do i need to take it to a shop or will a self-tuner make sure the air to fuel ratio is right on it? I dont want an extreme tune on it because i know more power=more gas…but what would you recommend for me? I just bought the SCT x3 tuner so I’ll let you know how it works!! !